Gillespie County produces 40% of all the peaches grown in the state of Texas. Roadside stands line many of the roads leading into Fredericksburg with a major concentration along Hwy 290 between Fredericksburg and Stonewall. No matter where they come from in the county or what they are called, Fredericksburg Peaches, Stonewall Peaches or Texas Hill Country Peaches they are all delicious! 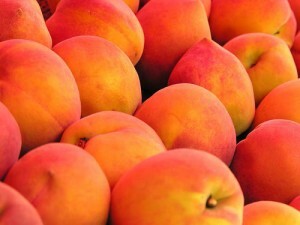 The Texas peach season runs from mid-May through the first week of August in a normal growing year. Whether you are looking for a pick your own orchard or pre-picked and ready at the stand there is something for everyone! If you are looking for a great family outing, go peach picking! The Hill Country Fruit Council produces a listing of its members in a brochure entitled Fredericksburg-Stonewall Peaches, which is on their website. Take a scenic drive to view the beautiful peach blossoms in the county. There are various routes to take to view various orchards. With over 1,400 acres of peaches in commercial production, it is likely there won’t be too much crowding at the orchards. Visiting in June? Join us for the annual Peach Jamboree in Stonewall! This week long celebration is complete with a parade and all kinds of delicious homemade peach goodies!